What are condensation funnel clouds? When and where can I see them? What do they say about the weather? These are only some of the questions you ask yourself when you encounter this term while learning about different types of clouds. Condensation funnel clouds are the rapidly spinning cloud formation from tornadoes which consist of condensed water droplets. This cloud formation is often confused with the funnel cloud. However, there is clear difference between the two. Condensation funnel cloud is a tornado, which means it is already in contact with the ground. A funnel cloud, on the other hand, does not reach the ground. However, tornadoes first develop as funnel clouds prior to coming in contact with the ground. How are condensation funnel clouds formed? Condensation funnel clouds are created by the condensation of water vapor within a thunderstorm as a result of wind shear that promotes rotation. This happens when warm air collides with cool air resulting to a thunderstorm. As the thunderstorm’s updraft and downdraft intensifies due to wind shear, the horizontal rotation of the storm turns vertical. A rotating wall cloud then develops and eventually builds up into a tornado. Where can I find condensation funnel clouds? This type of cloud develops from lower accessory clouds such as wall clouds. Wall clouds are the cloud formations found at the base of thunderstorm-producing clouds such as cumulonimbus clouds. The condensation funnel cloud can then be found at elevations below 6,500 feet; although it can also be located at a higher distance from the ground up to 10,000 feet from the surface during high-altitude tornadoes. What do Condensation funnel clouds look like? 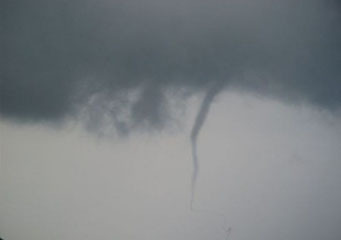 The appearance of condensation funnel clouds depends on the environment they were created in. If they develop under dry environment and pick up some amount of dirt, they take on a grayish color. If they are on the ground, condensation funnel clouds may materialize in brown color due to the accumulated debris and dust. Their color may even progress into a darker hue as the clouds continue to swirl on the ground taking up more dirt and dust. If they lift up red dust, they will adapt a red shade. How common are Condensation funnel clouds? These cloud formations are common in regions predisposed to tornadoes like the United States. Among the top areas vulnerable to tornadoes in the U.S. include the cities in Florida such as Miami, Hialeah, Hollywood, St. Peterburg and Tampa. North Little Rock in Arkansas, Houston in Texas, Commerce City and Aurora in Colorado as well as Denver, are tornado-prone areas too. Tornadoes may occur any time of the day and year, although they frequently develop between four and eight o’clock in the afternoon. Indeed, condensation funnel clouds are cloud formations of tornadoes. You must, therefore, find a safe place whenever you see this cloud starting to form.